Butterfly garlands can help to create a scene at your wedding or party that your guests will not soon forget. Hang strands of butterflies from ShopWildThings manzanita trees. Use them in your floral centerpieces to create whimsy and wonder to your decor. Butterfly Garland Strands come in garlands with one attached to the next with clear line. You can hang them full length, or drape them from branch to branch in a tree. They are so lightweight, that they will add no weight at all to your displays. Create a canopy of Butterflies on Strands by hanging them in groups. They will seem to float in mid-air. Most of the ShopWildThings Butterflies are made out of feathers which are dyed and then painted and decorated in unique and special ways. 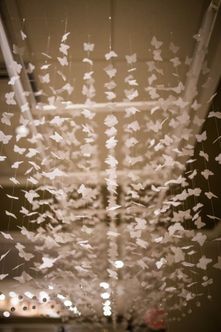 Use our White Butterfly Garlands for White Weddings and Receptions. Our more colorful designs run the range from light pastel colors to dark and rich Royal Blues and Purples.